We just got home from seeing Hancock. If you haven't seen it, don't read this. I can't say that I'm going to reveal anything but you're better off going into the movie knowing nothing. You'll enjoy it more. Trust me. The movie was alright. It had great superhero action, humor, cool effects, and a great cast. Will Smith and Jason Bateman are both excellent in their parts. So, with all that you sense that I won't give it a glowing review. You guessed right. Why not? I'm glad you asked. Hancock was a pretty good movie. It's worth seeing. But it could have been so much more....oh, so much more. One major problem I had with the film was the camera work. It was all herky-jerky with lots of way-too-close close ups and artsy-blurry stuff that don't belong in a superhero movie. To me it just looked shoddy. What else? Well, the story was a good start but it needed punching up. It was very surface...no depth. You know, a superhero/action movie doesn't have to be all action. We will enjoy it if the story is good and the action propels the story along logically. Iron Man is a prime example. 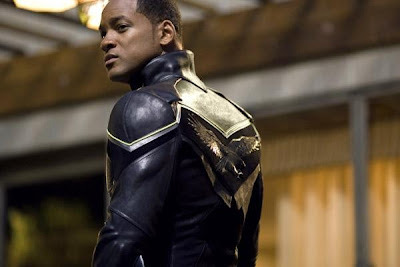 Now, let's talk about Will Smith. He is awesome but his last couple of films haven't been up to the level they should be. I Am Legend was very, very good but it wasn't incredible because it had too many flaws. This one also could have been incredible but it was flawed. I hope he'll be more careful in the future. I will watch him in anything but I prefer to watch him in a great film. I don't know what else to say about this film. My big disappointment in it is that it had so much potential and they didn't reach it. Not even close. But it is a very entertaining summer film. You will have fun.